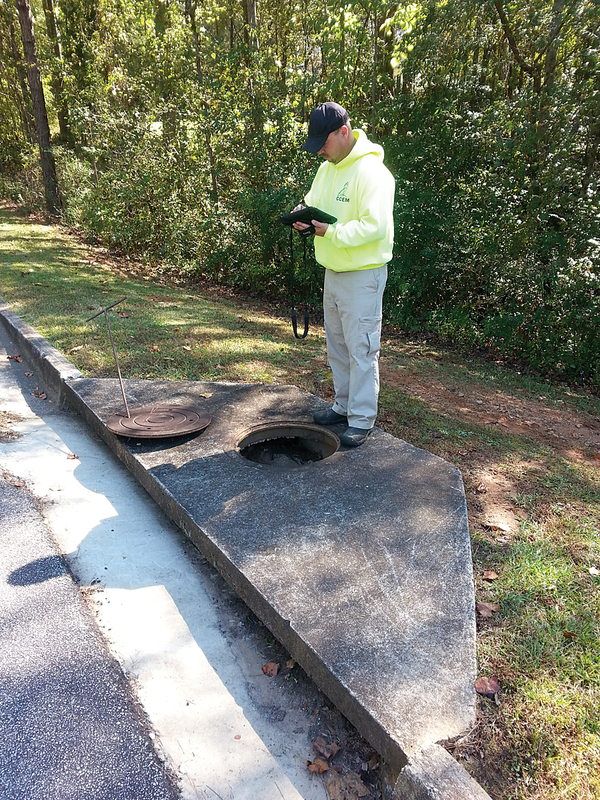 Coweta County field inspector Scotty Truitt inspects a catch basin in a subdivision. 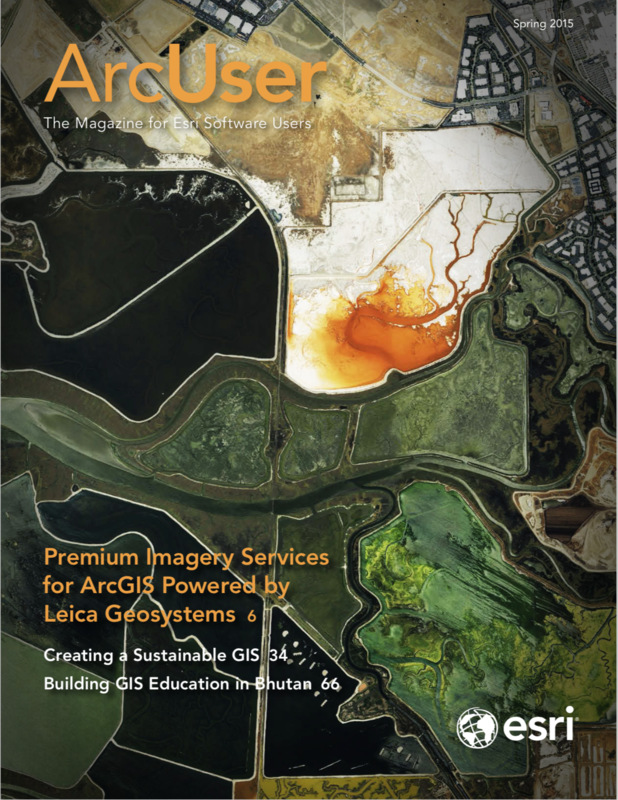 Collector for ArcGIS lets him document his findings. A county in Georgia discovered a way to deal with a skyrocketing demand for infrastructure inspections even as its field staff was greatly reduced. Coweta County, located just 30 minutes south of Atlanta, has a small-town feel, but over the past 20 years, industrial and commercial growth in the area has exploded and the population has more than doubled to 130,000. Something else doubled in the past two years: the number of required infrastructure inspections. Coweta County recently became part of the Metropolitan North Georgia Water Planning District. Now the county must adhere to stricter regional mandates that require new annual inspections of all urbanized infrastructure and at least 10 percent of the assets located in unincorporated areas. Dealing with this situation required the county’s GIS department to get creative. Clint Richmond, county GIS analyst, had read Esri articles that described how iPads could speed inspections and explored the use of iPads as an option for improving the inspection process. At the same time, the number of staff deployed to make the newly mandated inspections was reduced to just one employee—Scotty Truitt—who was now responsible for inspecting more than 15,000 assets. To make these inspections, Truitt used a clunky mobile device with a small screen. Each morning, he checked out the device from the divisional office and drove across the county to Richmond’s office so the GIS data he would need that day could be exported onto Truitt’s device. At the end of the day, Truitt returned to Richmond’s office, where data was downloaded to the GIS, and drove the device back to his office. If Truitt could transfer data in real time from a mobile device, it would mean a huge time savings. Coweta County GIS analyst Clint Richmond configured Collector for ArcGIS with multiple basemaps for field inspection. Coweta County started using ArcGIS for Desktop in 2007 to centralize the county’s departmental GIS use for tax assessment, public safety, planning, and engineering applications. In 2013, the county got an ArcGIS Online organizational account, which Richmond thought would help with inspections and user web applications. After testing the iPad with ArcGIS software, Richmond asked the county to get Truitt an iPad. 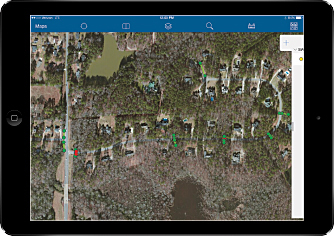 Richmond set up the organizational ArcGIS Online account with Esri, connected the iPad with Coweta County’s centralized GIS, and configured the Collector for ArcGIS app. The results have been remarkable. In 2012, Truitt completed slightly more than 50 inspections a day. The iPad has almost doubled his productivity. In 2014, he completed almost 100 inspections per day. The project has been so successful that Truitt finished all the mandated asset inspections halfway through 2014 and exceeded the mandated 10 percent for rural inspections by inspecting 40 percent of those structures. Selecting an attribute on the iPad pops up information the field inspector can edit and update. Truitt is now getting a jump start on a second set of regulatory initiatives that will require the county to map driveway pipelines. This is not yet a priority, but the county is making the most of Truitt’s free time. “There’s no big rush, just a year or so,” Richmond said. “But we were like, ‘Heck. Let’s just start finding them. 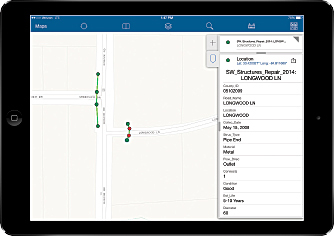 '” Truitt is now using the Collector for ArcGIS app on the iPad to locate driveway pipes. Richmond added aerial layers to Truitt’s basemap. “He can zoom in right where he’s at and draw the pipe in,” Richmond said.